Another interesting read from the Bailey's Prize shortlist and another book that has left me feeling somewhat conflicted. There is undeniable skill in McInerney's prose and her talent as a writer is evident in the grim lives she creates for her cast of wayward characters. One accidental murder has lasting consequences for the characters in this novel, set on the dark streets of post-crash Cork. Maureen is the elderly woman who returns to Cork to find her son Jimmy is the biggest gangster in town. Ryan is a bright teenager who cannot help but get in trouble for dealing drugs and misbehaving in school, though this is largely down to his Dad, Tony, who has a drink problem and a penchant to take his frustrations out on his son. Georgie is the down and out drug addict prostitute who glances salvation in the eyes of her newborn, only to have her taken away. These difficult and "gritty" lives see the characters pushed to their limits, repeatedly forced into doing things they don't want to, either by circumstance or nasty characters such as Jimmy. 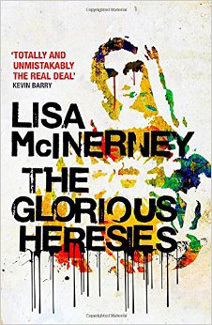 McInerney gives voice to the lower echelons of society, and through Ryan's character in particular, shows just how easy it is to fall into a life it is impossible to claw back from, when exposed to the things he is exposed to. Indeed, the sections I enjoyed most in the novel were those in which the reader was privy to the inner thoughts of Ryan, so vivid was his voice. His adolescent yearning positively pulses off the page and I was astonished at how brilliantly McInerney captured this character. The writing is sharp and the storytelling convincing, but I must admit it wasn't a book which held a great appeal to me. I think it is deserving of its place on the shortlist for the strength of the writing alone but I personally didn't connect with the characters in the same way as I did with those of Hanya Yanagihara.